July 2016 Horoscope for Libra predicts that the house of career is strong and the attention will be on business and profession. You will achieve success if you are diligent and your job will automatically improve. Family matters are important and will have to be taken care of when necessary. In July 2016, the Librans have to be more independent and personal accomplishments will be in focus. 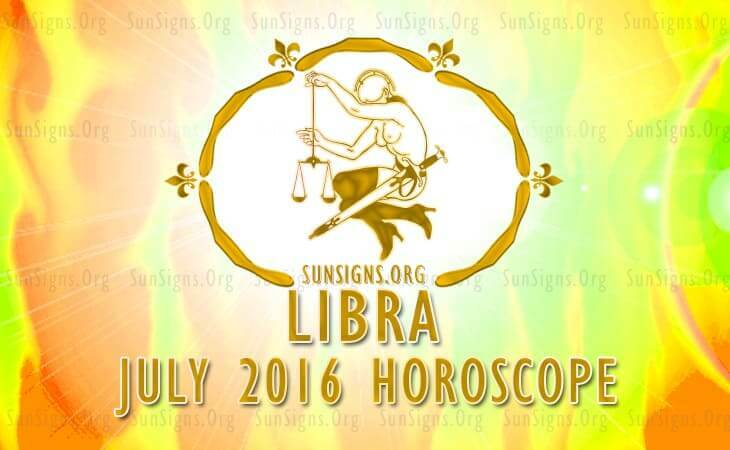 Libra, your career will be at its zenith during the month of July 2016 and many chances to grow will be available. During the third week, your efforts at business development will be appreciated and rewarded. Your professional status will improve and you will have more clout in the organization. The Libra July 2016 monthly astrology predictions foretell that your financial position is excellent, but requires plenty of effort. Situation improves after July 22nd. Career and educational activities may be a hindrance for your financial progress. Friends will assist your monetary efforts. Business partnership with your spouse or lover is likely. Love is more realistic for the Libra zodiac this month. You will be more active socially with participation in association of friends and romance will take a back seat in July 2016. Single Librans will have romantic opportunities with the help of friends in July 2016. Relationships will be friendlier and serious commitment will be absent. After the 21st, you will be dating with the intention of seeking idyllic and perfect love with spiritual compatibility. You might find your true love while engaged in philanthropic causes. Love can be found in academic surroundings also. Here are few tips to find out if he or she is your right partner. The Libra July 2016 forecasts warn that your health will be fragile and will get better only towards the end of the month. You will have a tough time balancing the various aspects of your life such as career, family and fiscal interests. You have to work intelligently to reduce tension and take up exercise activities outside the gym to remain in shape. To conclude, the Libra 2016 July horoscope forecasts a professionally fulfilling month which also requires that you take care of situations in the family.